Pandey is the substitute fielder for Pandya. The occasion of facing the arch-rivals brings the best out of the players more often than not and the same has happened with Team India. They looked rusty against Hong Kong and when many felt that they will be tired for an all-important encounter, the Men in Blue have bossed the tussle in Dubai so far. After opting to bat first, Pakistan have lost four wickets and the latest to be dismissed is Sarfraz Ahmed thanks to Manish Pandey’s acrobatics in the field. It all started with the likes of Bhuvneshwar Kumar and Jasprit Bumrah tying up the openers. The pressure was built on them from the word go and Fakhar Zaman and Imam-ul-Haq both perished playing poor shots and since then India have kept their run-rate in check. Though Babar Azam and Shoaib Malik did extremely well to bring them back, they were not given a lot of freebies by the spinners as well. However, once Babar fell to Kuldeep Yadav, the onus was on the skipper Sarfraz to lend support to Malik and take his team to a good score. Hardik Pandya’s injury forced Rohit Sharma to bring Kedar Jadhav into the attack. With his slingy action, Jadhav is very difficult to get away and it proved tough for the batsmen to go against him in his first over as he conceded only a solitary run. Also, Kuldeep bowling brilliantly from the other end put brakes on the run-scoring to add the pressure. In the 25th over of the innings, Kedar looped one to lure Sarfraz to play a big shot and he went for it. The batsman connected the slog well but Manish Pandey was stationed in the deep who is known for his heroics. 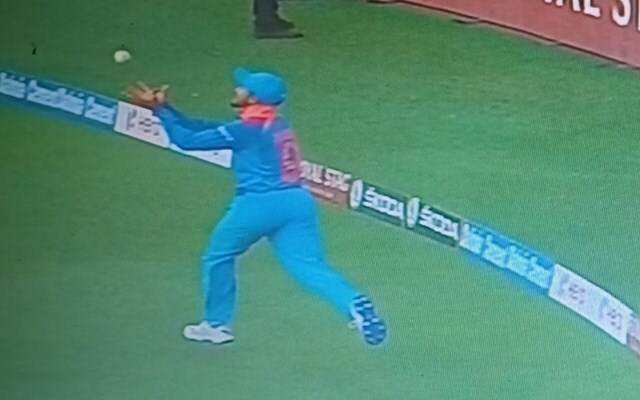 He got hold of the ball which was travelling over the ropes and just when his balance was taking him over the boundary line, Pandey threw the ball in the air only to come back and pouch it safely. It was a failure for Sarfraz as he could only muster six runs in 12 deliveries. It was a start of a collapse as they have continued to lose more wickets.